Circa 1930s; design essentially unchanged since the 1700s. The lying press was the fundamental piece of equipment in the hand bindery. With it (and its accessory backing boards, cutting boards, gilding boards, tub, and plough) the binder could press pages flat before sewing, hammer-back the sewn book, trim book edges and boards, and gild edges. The large lying press could fill in for the similar but much smaller finishing press, and be used when gluing and lining the spine, or when titling and gold-tooling the book. The lying press even became the binder’s workbench in large 19th century shops. What may be the first image of a lying press is in the baggage of a travelling binder in an early 14th-century manuscript (1); the first in use is by Jost Amman in 1568 (2). Until the middle 18th century all images show presses with the screws fixed rigidly in one cheek, with the other cheek sliding freely over the screws and tightened down by separate wooden nuts. This pattern of press has remained in use and available to the present day in Germany and Northern Europe. The plough for cutting book edges and binders’ board (sitting ready for use on top of our press) changed more in superficial appearance, but not in essence: two cheeks are connected by a screw and guide bars, with a blade between the cheeks; the book is held edge up in the press and the binder stands at one end, the plough is pushed forward cutting just one page and then pulled back, the screw is turned to move the cheeks closer together to cut just one more page, and the plough is again pushed forward and pulled back. This is repeated until the entire edge has been trimmed one page at a time. 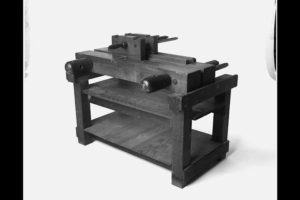 In the eighteenth century the lying press, like the closely related woodworker’s vise, became more refined. Images in Dudin’s L’art du Relieurand in the Diderot-Dalembert Encyclopédieshow various two-screw presses where the screw and attached handle move loosely in the near cheek and are threaded into the far cheek, so that turning the handles will tighten the press (3). In Dudin and Diderot the small benchtop presses, for edge-gilding and headbanding, have no “peg” or “garter,” so to open the press the screw must be loosened and the cheeks then pushed apart; however, the large “cutting” presses are pegged, so the cheeks can be moved apart simply by turning the screws in reverse. This design, the true lying press in its dedicated stand or “tub,” is effectively identical with our example, probably made in the 1930s; the same design was still available from commercial firms serving the binding industry in both America (from W.O. Hickok & Sons) and in England (from Hampson, Bettridge) until the 1960s or 1970s. As the 19th century went on, the various functions of the lying press were taken over by large, specialized cast-iron equipment, including the standing press, board shears, guillotine, job backer, and roller backer. Specialized presses were developed for uniform edge gilding, similar to the lying press but with iron instead of wooden screws: when edge-gilding an entire edition, the long powerful screws allowed dozens of copies to be screwed up and gilded in one load (4). The lying press remained the workhorse in small job binderies that couldn’t afford the cash or the space for every machine that would be of use to an edition binder. It remained particularly important to binders doing the very highest quality work, since the plough used skillfully produces a cleaner, smoother edge than the guillotine; it finally fell out of use among fine binders mostly because edge-trimming itself fell out of favor, and because it became increasingly difficult after the 1970s to get a professional-quality lying press or plough in good condition. Our example has a distinguished provenance. The noted San Francisco book restorer Stella Patri bought her first lying press while taking binding lessons from Octavia Holden in the 1930s. She had to give up binding for over twenty years, while raising her family, but her press became her symbol of her desire to return to binding. After she became a full-time professional in her middle sixties she acquired other presses, but her original press retained its iconic status. This press was acquired from her by Tim James in the 1990s; we are not certain that it was the original iconic press, but it a first-rate working tool in exceptionally good condition. It has one quirk, that the legs have been shortened awkwardly: Mrs. Patri was a small woman, and the press is rather large. “Reliure.” In: Diderot & d’Alembert, eds. Encyclopédie. Plates and captions reprinted by Inter-Liivres (Bibliotheque de I’image), 2001. Dudin, René Martin. L’art du Relieur Doreur de Livres. Paris: Académie Royale des Sciences, 1772. Translated by Richard Macintyre Atkinson as The Art of the Bookbinder and Gilder. Leeds: The Elmete Press, 1977. (1) See: Linda Lee, “Adventures of an Itinerant Bookbinder? Marginalia in an Early Fourteenth Century English Manuscript,” in: Roger Powell: The Compleat Binder. Liber amicorum.Ed. John L. Sharpe. “Bibliologia: Elementa ad Librorum Studia Pertinentia, Volume 14.” Turnhout: Brepols, 1996, p. 268-271.Three miniatures on one page show a craftsman setting out on a horseback journey, assisted by his wife. Behind the saddle (and, in one miniature, yoked around the man’s neck) is an object that at first sight very strongly suggests a finishing or small lying press; in the lower left miniature there is even an object that suggests a small plough (this “plough” is not mentioned by Lee). On close examination under magnification the attribution develops problems; the apparent press may have only one cheek, what looks like a handle is more likely part of the saddle (this would actually strengthen the attribution, since handleless presses seem to have preceeded handled), and so on. Still, defective perspective and small size can be blamed for many problems, the impression is certainly of a binders’ press, and no alternative explanation has been suggested. (2) Jost Amman (artist) and Hans Sachs (poet). “Der Buchbinder,” in: The Book of Trades [Ständebuch].Translated, with an Introduction by Benjamin A. Rifkin. New York: Dover, 1973, p. 2. (3) See Diderot & Dalembert, plates 2-5; Dudin, plates VIII, X. The publishing history of the Encyclopédieis complex; the citation is to a reprint of the original folio plates, but we have a set of plates similar but far from identical in content and number which appear to have been extracted from a later quarto edition or possibly from a later encyclopedia. For similar engravings of a German-style fixed-screw press (though without exploded views), and an exploded view of the circular-bladed plough still found in Northern Europe, see Hendrik de Haas’ Boekbinder; of volledige beschrijving van al het gene wat tot deze konst betrekking heeft. Dordrecht: A Blussé en Zoon, 1806, plates 1-3.